Enjoy a selection of freshly made finger sandwiches, warm fruit & plain scones, rum ball lollipops, panna cotta, blueberry red velvet cake & many more delights, served with your choice of tea or coffee. Terms & Conditions: Valid Sunday-Friday,12-5pm. Pre-booking is essential 48 hours prior to reservation. Valid 12 months purchase date. Your voucher will arrive in a gift envelope. Alternatively, you can have your voucher sent instantly by email. This Voucher is issued by The Elephant Hotel and expires on above expiration date. Once this Voucher is redeemed, it cannot be transferred to another person. Gratuities are not included. VAT is included in the purchase price of the Voucher. No limit to the number of vouchers that can be purchased per person or as gifts. Cannot be combined with any other offer. No cash value or cash back. Any additional items ordered will be charged at their full value. Partial redemptions: If you redeem this Voucher for less than its total face value, you will not be entitled to receive any credit or cash for the difference between the face value of the Voucher and the amount you actually redeemed unless otherwise required by applicable law. This Voucher can only be used for making purchases of goods and/or services at The Elephant Hotel, it cannot be redeemed for cash or applied as payment to any account unless required by applicable law. The Elephant Hotel shall not be responsible for Vouchers that are lost or damaged. If you lose your Voucher, please contact The Elephant Hotel. Select the voucher you would like, and add it to your basket. Personalise your voucher with a the recipient's name and a message. Make your payment securely online. Choose how you would like your gift delivered - immediately by email to you or the recipient, or by post. 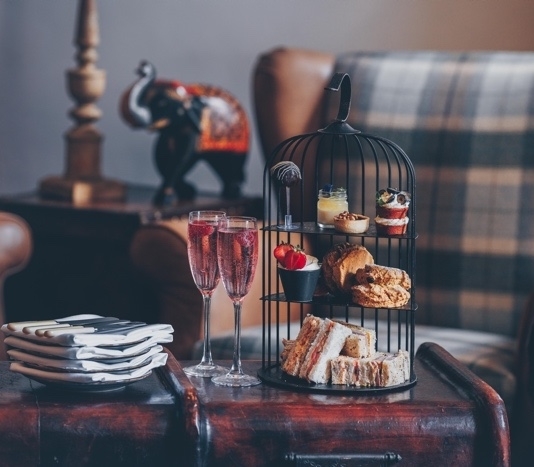 Treat yourself & someone special to our delicious Afternoon Tea with a glass of Prosecco at The Elephant Hotel. Question: What delivery and postal options are available? Your Gift Voucher will be shipped the same day if you place the order by 3pm Monday - Friday (exc. Bank Holidays). If your order is placed after 3pm, or at the weekend, it will be posted the next working day. Gift vouchers can be sent via email. Your gift voucher will be emailed to you after check-out as a PDF for you to print. Question: I'm experiencing difficulties placing an order online and checking out. What do I do? Answer: Please call us on 01189 842244 and we can process your voucher sale over the phone. Question: How do I print my Gift Voucher? Answer: You will receive a PDF attachment to the email address you provided, please open and print. All Gift Vouchers are designed by our marketing department, however, the quality of the print finish will be determined by the spec of your printer. Question: Can I have a VAT receipt for my Gift Voucher? Answer: We do not supply VAT receipts on Gift Voucher sales, however, VAT receipts can be issued on redemption of the Gift Voucher. Question: I have purchased my Gift Voucher and have noticed a mistake, can I get this amended? Question: Can I exchange or refund my Gift Voucher? Answer: Unfortunatley, vouchers are non-refundable and cannot be exchanged. Question: I have only part used my Gift voucher, can I carry the balance forward? Answer: Unfortuantley, each voucher has a unique identity code that can only be used for one transaction. Question: How do I redeem my Gift Voucher? Elephant Hotel is part of the Original Collection.